id Software CEO Todd Hollenshead asserted today that grass is green, the sky is blue and 3D technology is still too damn expensive to be of any real interest to mainstream gamers. The third dimension is all the rage these days. 3D movies, 3D television and of course 3D videogames promise a whole new level of immersion for media consumers. But while some companies, like Sony, are pounding that drum with all the fervor they can muster, there are others who think that maybe we're all getting ahead of ourselves just a bit. The technology is still on the rudimentary side of things and, more to the point, it's expensive as hell, too. "My most recent, 'Oh, okay, this is really cool' experience with 3D was with the movie Avatar, which everybody has seen. Even then, I was a little annoyed that I had to wear these glasses for two hours in a movie. My nose hurt by the end of it," id's Hollenshead told Eurogamer. "I know the stuff in your living room is different. You can get higher quality glasses that fit. But you still gotta sit in your living room wearing these glasses," he said. "And then if you're playing games and move your head then it can get out of phase, which is a major issue." "And also, the TVs are f**king expensive," he added. "Is there enough content to justify?" That's the problem facing the industry and consumers alike: Nobody wants to sink a few thousand bucks into a decent 3D setup if there's no content, and nobody wants to invest in creating 3D content if there's no market for it. Right now, according to Hollenshead, the market is still too niche to have a real impact on the industry. "At the very uber end of the videophiles, those guys are going to adopt that. But that's not going to be wide enough adoption to create substantial change within the gaming market. It has to be more pervasive and more widely adopted before it makes sense for videogame development companies to invest," he said. "To have really meaningful differences is going to require some more time. The price is going to have to come down and you're going to have to have more widespread adoption." 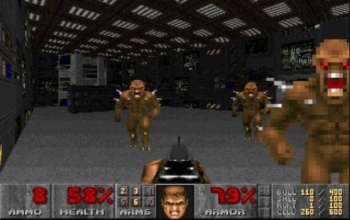 id is currently at work on Rage and Doom 4 and thus far there's been no indication that either will support 3D.